Parkinson’s disease causes involuntary movements that make it challenging for seniors to complete everyday tasks and live independently. While a cure for this disease does not currently exist, there are some steps seniors can take to minimize the side effects and provide relief. 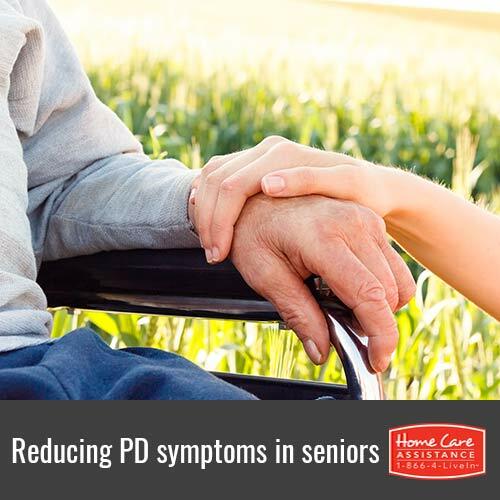 The experienced staff at Home Care Assistance, a leading provider of senior care in Harrisburg, offers these simple tips to help your senior loved one reduce his or her Parkinson’s symptoms. Stretching exercises, swimming, or taking a walk can help improve flexibility and reduce stiffness that seniors with Parkinson’s often experience. For the utmost safety, your loved one should be supervised and assisted during any physical activity, and it is also beneficial to consult with a physical therapist to develop an appropriate exercise plan. An adequate intake of vitamin D and CoQ10, an antioxidant thathelps convert food into energy, canhelp slow the progression of Parkinson’s. Additionally, moderate caffeine consumption might modestly improve movement-related symptoms of the disease. Consulting a doctor or nutritionist is advisable before making any significant changes to your loved one’s diet, since some foods and supplements can negatively interact with medications and potentially aggravate symptoms. Simple modifications around the home can help seniors with Parkinson’s move about freely, maintain their independence, and prevent dangerous slips and falls. These changes might include adding grab bars in the hallways, strategically placing non-slip rugs and furniture to avoid obstacles, or purchasing a shower seat. An occupational therapist can recommend assistive devices to make your loved one’s home life more comfortable. Seniors with Parkinson’s can benefit both physically and psychologically when the side effects are minimized, and taking the above measures can empower your loved one to continue to age in place and increase his or her ability to live productively. However, if your loved one needs any additional help managing the disease, consider the services of a professional caregiver. For Parkinson’s care Harrisburg families trust, turn to Home Care Assistance. Our caregivers can assist your aging loved one with a variety of tasks, including mobility and physical exercise, healthy meal preparation, and light housekeeping. For more information, call one of our qualified Care Managers at (717) 540-4663 to schedule a free in-home consultation.